Three great gift options to choose from: 3 Month, 6 Month and 12 Month Club Options! This is the gift that just keeps on giving. Each corresponding month you will receive a Family (20 cup) Bag or Gift Box to enjoy! 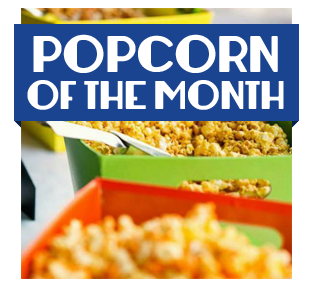 Check out the calendar below to see what great flavors we offer in each Popcorn Club. Each flavor will be shipped out within the first week of each month.The listed prices include your Shipping and Handling Costs. Please note – that listed prices do include your shipping and handling costs. When you checkout, there will be no added shipping! Shipped within the first week of the next three months. For example, if you place your order at the end of June, the shipments will arrive in July, August and September. Please see the flavors below. Shipped within the first week of the next six alternating months. For example, if you place your order at the end of June, the shipments will arrive in July, September, November, January, March and May. Please see the flavors below. *If you want the popcorn shipped for a birthday or special occasion, please comment during checkout and we will ship the first month’s order right away. For allergen information, please look at each individual flavor directly on the website or contact Koated Kernels directly.